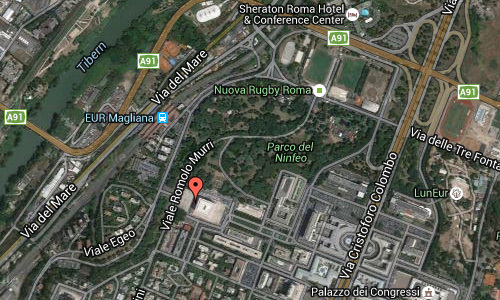 Colosseo Quadrato can be found at Quadrato della Concordia through Via del Turismo or Piazzale Ferruccio Parri in the EUR district in Rome, Italy. 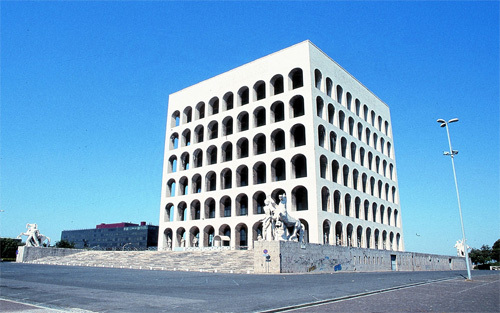 The Palazzo della Civiltà Italiana, also known as the Palazzo della Civiltà del Lavoro or simply the Colosseo Quadrato (Square Colosseum), is an icon of Fascist architecture. The building was designed in 1937 to host the Mostra della Civiltà Romana during the 1942 World Fair by Italian architects Giovanni Guerrini, Ernesto Bruno La Padula and Mario Romano. 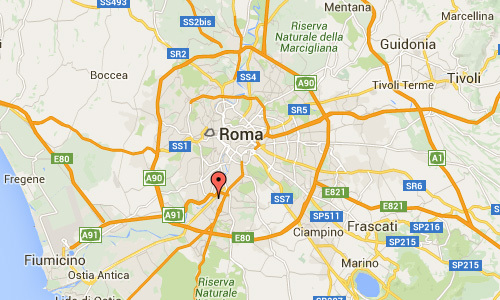 It lies in the district of Rome known as the Esposizione Universale Roma (also known as ‘E.42’ and ‘EUR’). It is particularly symbolic of this district, exemplifying its monumentality. 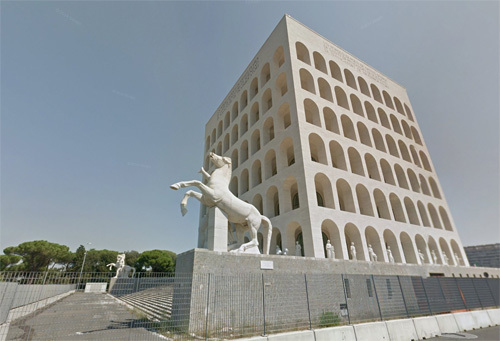 The Palazzo della Civiltà Italiana was constructed as part of the program of the Esposizione Universale Roma, a large business center and suburban complex, initiated in 1935 by Benito Mussolini for the planned 1942 world exhibition and as a symbol of fascism for the world. The Palazzo was designed by the architects Giovanni Guerrini, Ernesto Bruno Lapadula and Mario Romano and constructed between 1938 and 1943. It was inaugurated on 30 November 1940 as the centerpiece of the Esposizione and continues to be its most iconic building. The structure is also considered one of the most representative examples of Fascist architecture at the EUR. The exhibition was cancelled on June 3, 1941, while the building was being finished. It stood empty, abandoned over a decade. The building opened its doors to the public for the first time in 1953. It hosted the Roma 1953 Agricultural Exhibition (EA53). Between 2003 and 2008, the palace was closed to the public for restoration. Since 2015, it has housed the headquarters of luxury fashion label Fendi, and will continue to do so for the next 15 years at least. 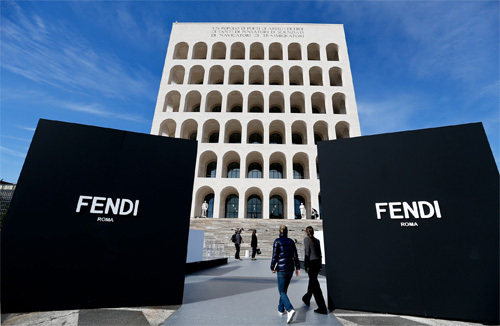 Fendi will reportedly pay 2.8 million euros per annum to occupy the space. The ground floor of the building will reportedly be left clear to house exhibitions celebrating Italian craftsmanship. An exhibition, entitled “Una Nuova Roma”, about the history of the EUR district will be on display until March 7th 2016, on the ground floor of the building. The EUR provides a large-scale image of how urban Italy might have looked if the fascist regime had not fallen during the war—large, symmetrical streets and austere buildings of limestone, tuff and marble, in either stile Littorio, inspired by ancient Roman architecture, or Rationalism. Its architectural style is often called simplified neoclassicism. 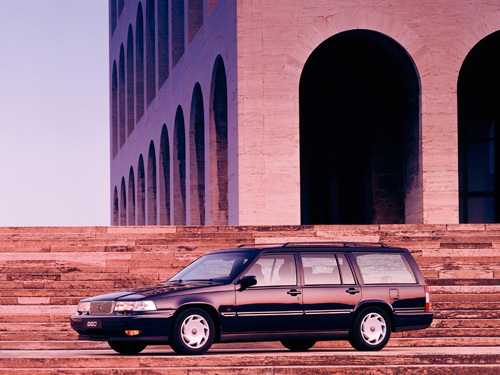 Marcello Piacentini, the coordinator of the commission for E42, based it on the Italian Rationalism of Pagano, Libera, and Michelucci. The design of the “Square Colosseum” was inspired more to celebrate the Colosseum, and the structure was intended by Benito Mussolini as a celebration of the older Roman landmark. Similar to the Colosseum, the palace has a series of superimposed loggias, shown on the façade as six rows of nine arches each. These numbers are said to be an allusion to the name of the Fascist dictator: “Benito” having six letters and “Mussolini,” nine. [by whom?] Atop all four sides of the building runs the inscription taken from a speech of Benito Mussolini on 2 October 1935:”Un popolo di poeti, di artisti, di eroi, di santi, di pensatori, di scienziati, di navigatori, di trasmigratori” (English: a nation of poets, of artists, of heroes, of saints, of thinkers, of scientists, of navigators, of migrants). The palace is entirely clad in travertine marble, as is characteristic of buildings in the EUR. It is a parallelepiped on a square base, with six levels rising above a podium. The scale is imposing: the base covers an area of 8,400 square meters, and the building has volume 205,000 cubic meters with a height 68 meters (50 meters from the base). 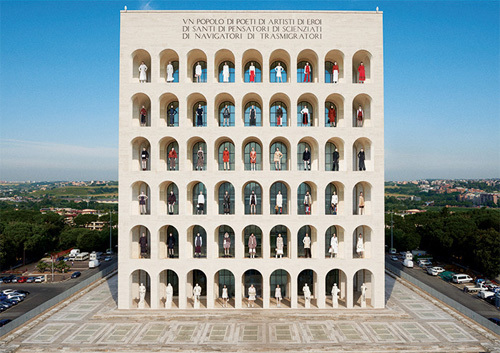 More information on www.fendi.com, en.wikipedia.org and www.disegnodaily.com.